I first tried some Boots essentials products a couple of years ago, but I didn’t really pay much attention to their effects or anything like that. I think i’d picked them up on a trip home to my mum’s when i’d not brought my usual skin care products with me, because my brain has and always will be a sieve. 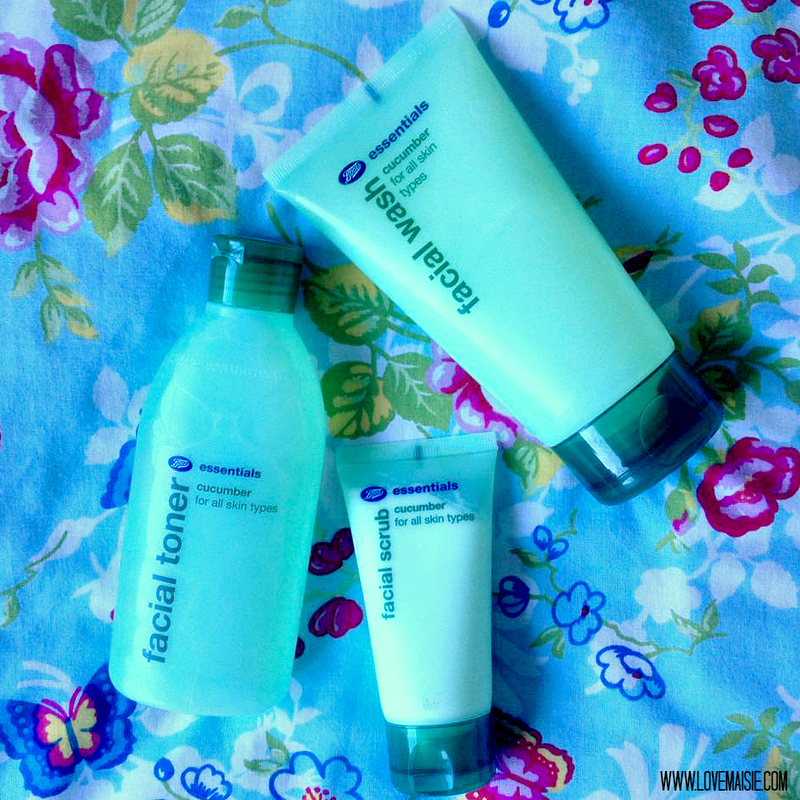 Upon my arrival back in sunny ol’ England, I was in Boots picking up some essentials(read re-purchasing my foundation and shower gels etc) and as I’ve been pretty strapped for cash recently, I thought i’d grab a couple of items from the Boots essentials skin care range and give them a proper go. I picked up three different items, hooray for the Boots 3 for 2 offer, the cucumber facial toner, the cucumber facial wash and the cucumber facial scrub. All of these items were £1.50 each and with the 3 for 2 offer it made the total of all three items just £3! I’ve previously used the boots essential’s cucumber facial toner and after repurchasing it recently, I think it’s safe to say that it’s my favourite toner right now. Not only does it smell delicious, I really like the scent of cucumber, but it feels so refreshing on the skin! If you’ve been reading Love, Maisie for a while you’ll know that I use my Garnier Micellar water on a day to day basis and I highly recommend it to everyone, even those with sensitive skin, but you’d be amazed at how much of a difference also using a toner makes to your skin! It leaves my skin feeling super refreshed and snatches up the last bits of dirt and makeup. I even feel as though the tone of my skin has improved over the last couple of weeks! 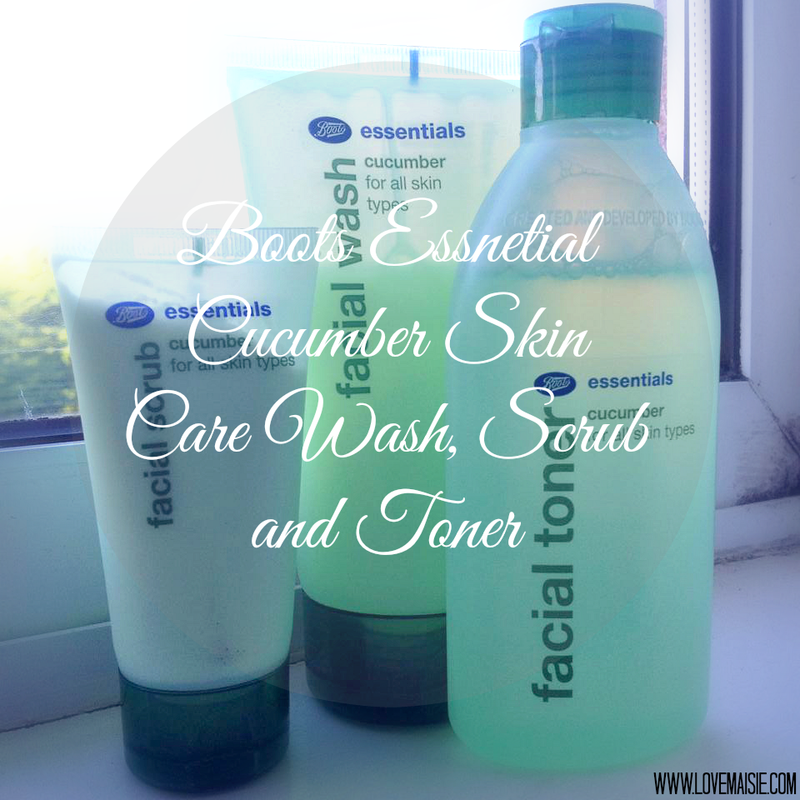 I hadn’t used the Boots essential cucumber facial wash or scrub until recently and I really do rate these two products as highly as the toner! The facial wash feels silky soft on my skin and leaves my skin feeling the super smooth too. The facial scrub is again, lovely and refreshing and it makes for a nice gentle face scrub. Although, as it is quite gentle, I fear that if you have super dry skin, this might not quite do the job as thoroughly for you. All of the above products are supposedly suitable for all skin types. I have rather oily skin and I find that these products don’t cause any excess oil build up or have any sort of oily residue, nor do I find them at all drying. My skin can sometimes be fairly sensitive too and I haven’t had any adverse reactions from any of the three products, so overall, they’re all winners!